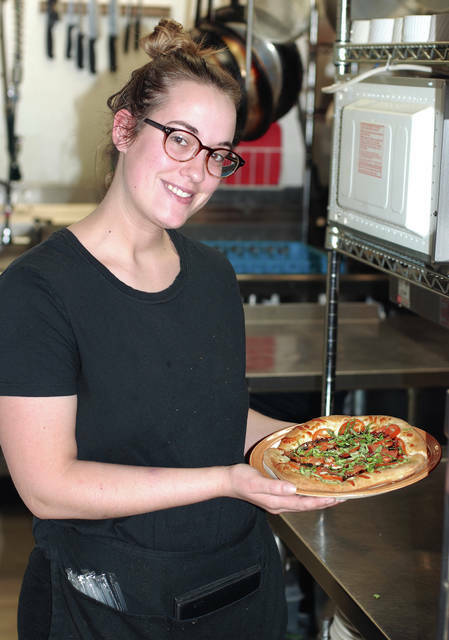 Katy Hammond poses with a freshly-baked pizza on Tuesday during the lunch hour at Cafe Paradiso. Restaurant received same honor in cleveland.com’s last pizza survey in 2016. Cafe Paradiso on Monument Square once again has been named Champaign County’s best pizza place in a cleveland.com rating of pizza places throughout Ohio. The website last did the county by county rating in 2016 and determined the Italian restaurant offered the best in the county. A new rating of pizza places in all 88 counties was just released and the Urbana restaurant is tops in pizza again. “This has been awesome,” restaurant owner Pat Thackery said Tuesday. He operates the restaurant, located at 13 Monument Square, with his wife, Patsy. Asked what makes the pizza so yummy, Thackery said olive oil and only fresh ingredients are used, and he praised his staff’s skills. “We’ve got some talent in the kitchen, and I’m proud of that,” he said. It’s the same talent, he said, that was in the kitchen three years ago when cleveland.com issued the previous kudos. “We do it because we enjoy doing it,” he said of the creation of the restaurant’s eight pizzas: braised beef; cheese with marinara; chicken bruschetta; chicken florentine; margherita; pepperoni with marinara; red, white and bleu and Sally’s. Open Mondays through Saturdays, Cafe Paradiso serves pizza from 11 a.m. until the 4 p.m. dinner menu starts. Visit the website and scroll through the pizza place picks in each Ohio county. It may be the start of 88 road trips.